Some recent New York grads won't have to pay anything towards their student loans for two years. It just got a little easier for recent grads to make it in New York. The state will pay up to two years of student loan bills for residents who are struggling to pay down their debt. The loan forgiveness program, called "Get on Your Feet" by the Cuomo administration, aims to help out grads who maybe haven't landed their dream job just yet. You're only eligible if you earn less than $50,000 a year and live in state. You must also have graduated after December 2014 from a college or university in New York and you must be enrolled in an income-based repayment plan with the federal government. These plans typically cap your monthly bill at 10% or 15% of your discretionary income, but are only an option for those with a lot of debt and little earnings. New York will only cover the cost of your monthly bill on federal loans. If you borrowed from a private lender, you're still on the hook for those payments. The program went live on December 31 and you can apply online. "Ensuring students are able pay for college and not saddled with debt is critical for both their individual success and the continued economic growth of New York State," said Governor Andrew Cuomo. 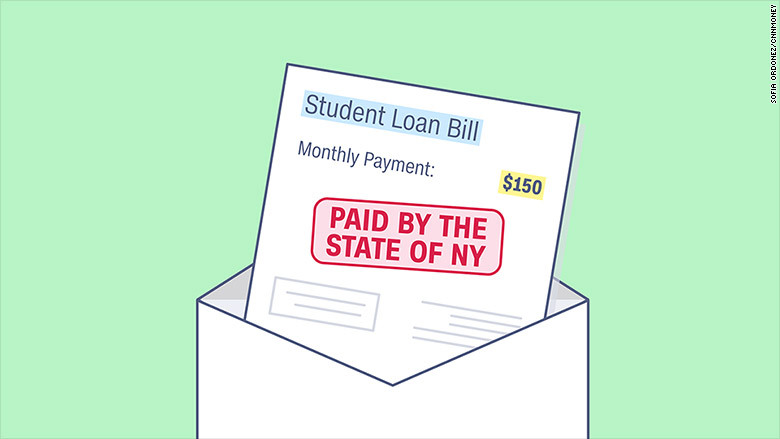 New York is the first state to offer loan forgiveness on the basis of income. But at least 35 other states have a similar program that's based on the type of industry you work in and where you live, according to the National Conference of State Legislatures. They aim to encourage people to live and work in underserved communities and take public service-oriented jobs like teachers, social workers and health care workers. The governor's office estimates that 7,100 recent grads will take advantage of the New York program this year. It expects 24,000 grads will be enrolled by 2020 and at that point cost about $41.7 million. It's unclear whether the income threshold will go up over time and the governor's office did not return a call requesting comment. In 2014, 61% of New York grads left school in debt, averaging an amount of $27,822, according to the Institute for College Access and Success.